As the Castro’s government approaches its fiftieth anniversary, the Cuban economy is increasingly showing the cumulative negative impact of the policies implemented in the context of the revolution.1 Looking forward, Raúl Castro and the rest of the current ruling class are facing a number of significant challenges that will test their ability to govern in the near future. This essay identifies some of the most important of these challenges, discusses steps that the authorities have been taking to cope with some of them,2 and evaluates the likelihood that these policies will help to resolve some of the outstanding issues. What are some of these challenges? Among the most important are to: (1) raise the low productivity of the workers and of the economy at large; (2) increase domestic food production; (3) provide adequate housing to the population; (4) take care of an aging population and reverse the emigration of young people; (5) provide adequate transportation; (6) reduce dependence on foreign oil; (7) repair and replace a deteriorated infrastructure (factories, roads, railroads, sewerage systems, etc); (8) eliminate the economic distortions brought about by the multiple currency system, the artificial and arbitrary exchange rate, and the indiscriminate subsidies arising from the operation of the libreta de racionamiento; (9) restore the quality of medical services and education; (10) reestablish the credit worthiness of the Cuban economy in international markets; (11) liberalize the labor market, including by allowing widespread development of self employment activities (actividades por cuenta propia) and the establishment of small and medium sized private enterprises; and (12) establish a clearly defined legal framework that is consistently applied by the authorities, and well known and respected by the population. Perhaps the most important negative consequence of the revolutionary policies has been the decline in the productivity of the economy, and the most significant challenge facing the authorities is how to incentivize the population to increase production and productivity. The economic system implemented by the Castro administration has been incapable of increasing production so as to be able to satisfy the domestic demand for food and generate exports. Last year Raúl Castro asked some 3,000 public enterprises and state agencies to identify the main problems that they were encountering and to make proposals to solve them. The respondents blamed their problems mainly on the centralization of decision making, citing specifically the bureaucratic controls imposed by the Ministry of Economy and Planning and the Ministry of Foreign Trade, and the regulations whereby all transactions in foreign exchange have to be channeled through a single account at the Central Bank and individual authorizations have to be obtained for each withdrawal. Moreover, individuals complained about the indolence of public officials in addressing the problems that are brought to their attention. At the same time, it has to be pointed out that the participation of midlevel public officials tends to be limited to supporting and implementing what has been decided at higher levels of government, without questioning their rationale or accepting responsibility for the decisions. Raúl Castro himself has blamed the inefficiency of the economy and the scarcity of many goods on the prevalence of corruption, lack of administrative control, and labor indiscipline. So far, the government has reacted by enacting a new set of labor regulations that establish more stringent disciplinary measures for those workers who are not punctual, absent without prior authorization, negligent in the use of equipment and other resources, lose or steal materials or divert them to other (personal) uses, fail to report violations of the rules by others, etc. It has also stepped up raids against people who engage in private economic activities without prior government authorization, which for the most part are denied. Workers have criticized most of these rules by arguing that it is impossible to arrive on time at the workplace when the transportation system is not working, that they cannot do their own shopping for food and other necessities during weekends and off working hours because the state stores are not open at those times, and that salaries paid by the government are not sufficient to meet living expenses. The average monthly salary in Cuba is currently 408 Cuban pesos, or about US$20.00. One positive step announced by the authorities has been the elimination of the ceiling on state employees’ wages, so as to allow for better pay for better performers. The government has recently announced that workers can earn productivity bonuses, doing away with the egalitarian concept that everyone must earn the same independently of how productive they are. However, it remains to be seen whether this policy will be administered without favoritism or as a source of political patronage. Despite their depressed level, wages have continued to rise faster than productivity in an economy where more than 90% of economic activity is controlled by the state. Economy and Planning Minister Rodríguez has admitted that the correlation between the gain in productivity and increases in salaries during the first half of 2008 was not favorable, as average salaries rose by 4.6% while productivity increased only by 3.5%. Meanwhile, the government engages in labor policies and practices that violate fundamental human rights and are in disregard of international treaties and conventions of which the Cuban Government is signatory. These practices distort the impact of external foreign private investment in the island, lower the level of wages paid, result in a misallocation of labor; contribute to reduce the level of economic activity; and impede the economic growth of the country. An additional problem is that there are thousands of young people who do not want to work for the Government because they are not prepared to accept either the working conditions or the pay, which they find too low. Instead they try to “resolve” their situation by engaging in activities that the government considers illegal or by leaving the country. There has been an intensification of the persecution of individuals that engage in private activities without prior government authorization and of black market operations by closing illegal factories and repair shops that meet demands that the government can not satisfy. The problem of motivating young people to work cannot be tackled by use of force and repression: it needs to be approached by giving appropriate incentives and by creating conditions that give individuals assurances about their future. It is interesting to note that, at the same time that the government represses most private activities, it announces the possibility for private individuals to engage in some activities where the government has failed to meet the population needs, such as transportation and housing construction. There is clearly a need to decentralize decision making at all levels and for all types of activities but this cannot be done without substantial structural reform of the economic system so as to provide room for individual initiative and limit the role of the State in establishing general guidelines and to provide the appropriate legal framework for private activities to operate and carry on most economic activities. The problems of low productivity, shortages of food, deterioration of the housing stock, improper utilization of the labor force, and others mentioned above are not new to the Cuban Revolutionary Government. In fact, most of them had already been identified back in 1986 following the collapse of the Soviet Union, and they were extensively discussed during the IV Congress of the Communist Party in 1991. At that time, they gave rise to some of the timid liberalization measures taken under the aegis of the “process of rectification of errors and negative tendencies,” and which sought to increase particularly food production, and more generally the efficiency of the economy. Interestingly enough, the main conclusions of those discussions were that there was a need for decentralizing decision making and for an improvement in the administration of the State enterprises. The need to get away from dogmatism and the emphasis on unanimity and to have a renovation of the leading classes was stressed at that time. Not much seems to have changed since then. A second challenge, somewhat related to the previous one, is the need to increase food production. The amount of land dedicated to food cultivation is down 33% in the past nine years. Production of most foodstuffs have been declining for the last three years and this has given rise to the need to import a growing volume of food to feed the population. Cuba is facing a crisis in agriculture. The country imports more than 50% of its basic foodstuffs and is heavily dependent on U.S. food imports. Last year, Cuba spent nearly $1.5 billion for food imports, and about 84% of the food imports came from producers in the United States that were granted a special exemption from Washington’s trade embargo. The problem is getting compounded by the recent rise in the prices of many foodstuffs in the international markets that has come about as a consequence of the increase global cost of energy. Vice President Carlos Lage has indicated that in 2007, Cuba spent $1.47 billion to import 3,423 million tons of food. To import the same amount in 2008 at current prices will cost $2.554 billion, a billion dollars more. 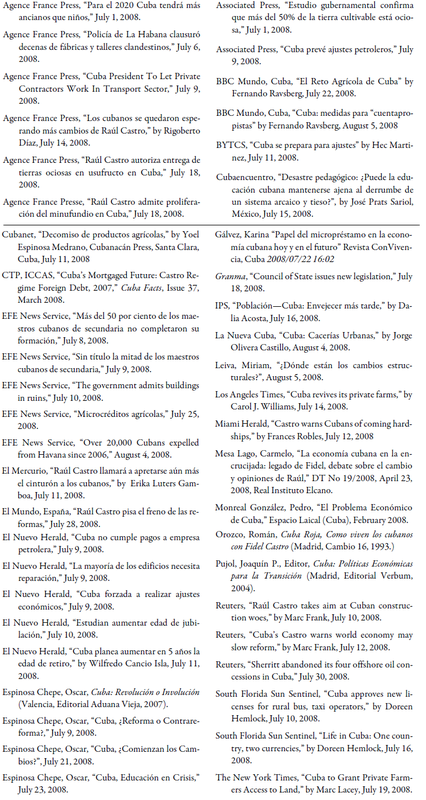 According to the Communist Party newspaper Granma, “The impact of the substantial rise of food and fuel prices on the international market so far this year … will require inevitable adjustments and restrictions on the national economy.” Raúl Castro himself has identified the production of foodstuffs as a matter of the highest national security and has indicated that there is a need of structural reforms in this area to bring about significant increases in production. Shortages of food are more intense in the eastern provinces of the country and are one of the reasons why residents of those regions try to migrate to Havana, which the government tries to prevent. Of the most important items of Cuba’s agricultural production (sugar, citrus, rice, eggs, tobacco, coffee, tubers, milk, and cattle) only tubers had a higher volume of production in 2007 than in 1989. Meanwhile, large tracts of land owned by the government are idle and invaded by marabú (a nasty bush that takes over idle lands and is very difficult to eradicate). In 2007, citrus production was 56% below the level achieved in 1989, rice 18% below, eggs 12% below, tobacco leaf 33% below, coffee 85% below and milk 57% below. The cattle herd, which in 1967 was about 7 million, had been reduced to one half by 2006. Dairy output has been slumping since the early 1990s, fundamentally due to very low investment by the dairy cooperatives and the failure to keep their herds and/or pastures in good shape. Until recently, the set price the government paid farmers for milk was well below its cost of production. Cuban state enterprises produced about 10% of the 700,000 tons of rice consumed last year; private farmers produced about twice that much, so that about 70% of domestic consumption had to be imported. Until the early 1990s Cuba had one of the largest sugar industries in the world, but in 2002 the government made a significant reduction in the number of sugar mills (from 156 to fewer than 70), shifted about 60% of the land previously devoted to sugar cane cultivation to other uses, and removed some 100,000 workers from sugar production. Since then, the annual volume of sugar production, which had averaged close to 8 million tons in the late 1980s, dropped sharply to less than one-third and has not recovered. Sugar cane agricultural productivity per hectare fell from 68 to 28 tons (compared to a world average of around 70 tons) and sugar industrial yield from 12% (already quite low by international standards) to 10%. The island only produced 1.2 million tons of sugar in 2007, of which 700,000 were consumed domestically. This was barely 45,000 tons more than in 2006, and well under the target for 2007 of 1.6 million tons. The harvest lasted only 113 days, with 41% of the time lost for various reasons (delays in starting the harvest; only 51 mills in operation, of which 4 started late; delays in repairs; frequent equipment breakdowns; shortages of fuel and other imported inputs; less land under cultivation, of which about 30% covered by marabú; and lack of labor incentives). For 2008, the government announced a target of 3 million tons of sugar, but similar problems continued to plague the sugar industry and only 1.4 million tons are estimated to be produced despite a longer harvest. The harvest typically runs from December through April (when the rainy season begins), but in 2008 mills ground into June due to an unusually dry May. The extension of the harvest could have a negative impact on the yield of next year’s harvest. Sugar, which used to be the major export earner for Cuba, has now dropped below medical services, minerals, tourism, and even pharmaceutical products, and Cuba has had to import as much as 250,000 tons of sugar from Brazil and Colombia to meet its domestic consumption and export commitments. In the case of citrus products (oranges, grapefruits and lemons), the authorities have recognized that it may take at least five years to be able to reach the volume of production in the 1990s, when they reached one million tons. In 2007, citrus production was only 370,000 tons. The problems of Cuban agriculture are not new: they started half a century ago with the implementation of an agrarian reform by the revolutionary government that concentrated most of the land in a giant and inoperative state-controlled system. Since 1959, some Cubans have been allowed to run small family farms but most agriculture has been placed in the hands of large, state-owned enterprises. The backsliding of Cuban agriculture intensified since 2004, when Fidel Castro halved sugar cane growing and milling, amid a global world slump in sugar prices, and restored limits on the sale of privately grown produce in an effort to prevent what he considered “farmers’ exploitation of urban compatriots.” The government also failed to fulfill promises of better housing for many of the large farming cooperatives in remote rural areas. These have traditionally operated with much less efficiency than the urban and suburban patches planted by private individuals that have easier access to buyers. Currently, more than half of Cuba’s agricultural land is idle or underutilized. Of the 6.6 million hectares classified as agricultural, about 3 million were not being utilized in 2002, and this number had risen to 3.6 million by 2007. Thus, according to a study posted on the web site of the National Statistical Office, the percentage of Cuban farm land that is fallow or underused increased to 55% in 2007 from 46% in 2002. State-run farms now hold a little more than one-third of Cuba’s agricultural lands, down from about 70% two decades ago. The rest of farm lands are worked by small farmers and cooperatives. At the end of 2007, of the 6.6 million hectares of agricultural land, state-run farms (UBPS) held 2.8 million, cooperatives (CPA) 962,000, and private farmers 1.4 million. Official statistics show that 54% of private land is actively used, compared with just 29% of land in state-run farms. To reverse the above mentioned trends, Cuba’s government in early 2008 announced a series of plans to effectively restructure its Agriculture Ministry by decentralizing the process of decision making. Municipalities are being authorized to decide how best to use resources and land, organize distribution of produce, and deal with the day-to-day issues in agriculture, decisions previously made at higher levels of the government. The government also ordered the prompt payment of outstanding claims of farmers, began paying farmers more for the milk and meat they sell to the State, and cancelled the debts of some small producers. They also granted some idle land to small farmers and cooperatives, and gave them greater leeway as to what to cultivate. Small farmers have also been allowed more flexibility to buy tools and farming equipment directly—the distribution of which had been previously centralized. Under the new system, private farmers, who have continued to exist under Cuba’s socialist system, would have access to some plots of land for up to a decade, with leases renewable if conditions were met and taxes paid. According to the decree establishing the new system, “the maximum to be handed over to individuals who do not hold land is 13.42 hectares (33 acres), and to those who hold land, as owners or designated workers, the amount can rise as high as 40.26 hectares (99 acres).” Cooperatives and state farms would also qualify for more land, for up to 25 years. But the fields would continue to stay under the ownership of the government, which controls an estimated 90% of the island’s economy. Moreover, the land handed over cannot be transferred or sold to third parties, and the beneficiary must pay a tax. The new procedures, already mentioned several months ago but formally announced only in July 2008, are intended to jump-start food production at a time when Cuba is feeling the effects of the global rise in food prices. With this strategy, Raúl Castro is expecting to reactivate food production and reduce Cuba’s dependence on imports at a time when international prices are very high and rising. However, it should be noticed that the land is turned over subject to a number of conditions that if not met could reverse the transfer, such as if the farmer does not produce the crops specified by government specialists or he or she engages in actions that would be contrary to the purpose for which the lease was granted. This seems to imply that the authorities would want to continue to dictate how the land is used and what will be done with the crops grown, regardless of the wishes of the lessee. Since the land being leased is in such poor condition, covered with marabú, it will require a substantial effort on the part of the farmers to bring it back into production. There will have to be significant expenditures to build even basic structures to serve as barns and provide living quarters for the farmers, as well as in the purchase or renting of tools and other inputs. Thus the farmers will need to have sufficient guarantees that their permanence will be respected for a sufficient period to permit the recuperation of the investments undertaken. Small farmers have been demanding for quite some time the adoption of a new agrarian legislation that will give some guarantees to private initiative and reduce government intervention. A recuperation of agricultural production will only be feasible if sufficient incentives are granted from the beginning and if a legal system is in place that will give assurances to the farmers that they will not be disposed in an arbitrary manner. The availability of agricultural inputs in Cuba has been a consistent problem ever since the collapse of the Soviet Union in the early 1990s. Farmers should be able to buy their necessary inputs in a free market (including the contract of laborers to help with the cultivation and the harvest) and allowed to freely sell their produce in the agricultural markets without being forced to turn over their production to the government at prices that many times do not even cover the cost of production. Unless this is done, the chances for a significant increase in food production in Cuba will be very slim and the risks of a major shortfall in case of adverse weather conditions quite significant. The poor condition of the housing stock and the need for new housing construction was one of the topics most frequently raised in the assemblies organized over the past year to discuss the problems faced by the island and to make proposals for their solution. Cuba has an enormous, chronic housing shortage, and a large need for repairing crumbling buildings. The adoption of measures to address these problems is long overdue. From 1959 to 2007, while the population of the island doubled, the number of new housing units constructed fell below those destroyed because of lack of maintenance and repairs. The National Housing Institute (INV) has recognized that of the 47,000 buildings with more than three stories that exist in Cuba, 85% (more than 40,000) are in need of repairs. According to official statistics, there was a deficit of 600,000 housing units in the country.3 In 2007, the government announced the construction of 52,607 houses, compared to a target of 70,000. For 2008, the target was set at 50,000 but even if this year’s target were met, the new units would only represent 5% to 7% of the accumulated deficit. A government official recently admitted that the plans for construction of new, and repair of existing, housing will not be met in 2008 because of lack of resources. Víctor Ramírez, President of the INV, told the national press that fewer than half of the housing units planned for construction between January and July of 2008 were completed because of shortages of material. This result is rather puzzling as the INV has recognized that foreign exchange expenditures to reactivate this industry have been very substantial, and the shortages of materials can only be explained by looking at the growing black market for construction material and equipment. A Parliamentary hearing on the housing sector focused on the lack of organization and theft plaguing the state-run construction industry and on the failure of the industry to meet apartment building construction plans or to conclude large projects on schedule and within budget. The authorities recently announced the beginning of a process of decentralizing decision-making in construction. The local authorities now have a say on they prefer to allocate the resources assigned to them, be it finishing new apartments or prioritizing the repair of others. The logic is that at the municipal level, the authorities know best an area’s urgent needs and how to deal with them. There has also been talk about granting construction licenses to private individuals. Cuba began granting licenses to individuals to privately engage in building trades in the 1990s, but has not granted new ones in a number of years. While the state construction business has a chronic labor shortage, thousands of licensed and unlicensed skilled tradesmen and laborers work privately, but illegally. Contributing to the housing problem is the prohibition Cubans face to own their homes and sell them, rent them, or obtain mortgages in order to improve them. Since the homes belong to the State—who can (and will) take them away at any time—there is no incentive for individuals to fix them up or invest in improving them. While there is a system for exchanging equivalent living quarters (permuta) it is extremely bureaucratic and inefficient, and its operation is a source of corruption. Recently the government announced that some government workers would be allowed to take title to their homes, but this is a very limited program to which only a few people are eligible. The government has shown that it is incapable of solving the housing problem. It needs to return to a property regime in which individuals can own their homes and dispose of them as they see fit. Only then will individuals have appropriate incentives to repair and maintain the properties. At the same time, private construction firms need to be allowed to operate and have legal access to the inputs required for their operations. Another challenge comes from the need to take care of an aging population and the exodus of young people from the country. The recent increase in pensions cost the government one billion pesos per annum and pensions represent some 6% of Gross Domestic Product (GDP). The 1.82 million people 60 years or older in 2007 will grow to 2.9 million by 2025. This will have a tremendous impact on government expenditures for social security and on the need to allocate resources for medical care of the elder. The problem has been compounded by the continuous and growing exodus of young people from the island. The population has contracted in the last few years and it is estimated that by 2020 Cuba will have more old people than children. The combination of negative population growth and an older population implies a reduction in the labor force, an increase in expenditures for social security, health services, and pensions, and a drop in productivity. The proportion of workers to retired persons went from 7.1–to-1 in 1970 to 3.1–to-1 in 2007, and is expected to fall to 2.3–to-1 by 2024. According to the Labor Minister, by 2025 there will be 770,000 fewer working-age people than in 2007. In response to these developments, Cuba has decided to delay retirement age by five years, to 65 years of age for men and 60 for women, so as to offset the country’s dwindling labor force. Once approved into law, the new measures will go into effect incrementally from 2009 to 2015. Moreover, to try to make up for a shrinking labor force, the government has announced that retired persons who are prepared to go back to work (especially in the education field) may receive a salary for these services in addition to their pension. However, workers and enterprises will have to pay a new levy to the social security system. The coverage of social security will be extended to the self-employed in those activities that had been authorized in 1994; this extension will cover an estimated 150,000 individuals. The proposed changes would also include a change in the way pensions are calculated, with additional payments for those whose working years surpass the 30 years now required for retirement. The government is also studying other measures to stimulate new births, improve labor conditions for workers, and increase social security benefits. While these measures may provide some limited relief by enticing people to remain active in the labor force longer and reduce somewhat the fiscal burden, they are not sufficient to reverse the demographic trends. Before the revolution, Cuba was a country that attracted immigrants because of growing economic opportunities. Today, its youth leaves to seek opportunities elsewhere. The system provides them with an education, but it is not capable of providing them with attractive employment in the fields in which they are trained. With an opening of the economy to private enterprise, numerous opportunities would arise for additional employment and economic growth. The lack of adequate transportation not only affects the productivity of the economy but is a source of constant frustration to the population. INV President Ramírez has said that a lack of transportation for moving construction material is one of the reasons hampering the implementation of the housing program. In Cuba, where the majority of motor vehicles belong to the State, some private individuals use their vehicles to transport passengers as a way to complement their meager salaries. Licenses for private transportation were authorized as part of the reforms of the 1990s to alleviate the crisis brought about by the collapse of the Soviet Union and the suspension of the Soviet subsidies to Cuba. The Soviet Union had been the main supplier of motorized equipment and the loss of these supplies resulted in a collapse of transportation within the island. But the concession of new licenses was suspended in 1999 without any explanation and this gave rise to strong criticisms. After almost a decade on the sidelines, Raúl Castro will now allow private contractors back into Cuba’s transport sector to try to jumpstart the stalled system. The government has recently announced the granting of new licenses for self-employed workers who have a car and want to transport passengers as a taxi. However, the government will be deciding which routes will be serviced by these taxis and will be selling them their gasoline. So individuals will have little leeway to use their initiative to operate their taxis. According to the new rules, licenses “will be approved one at a time, the fuel will be given (to the operator), prices will be set, each route will be established by the government, as will be the schedule of the service.” Thus, they will operate as if they were public buses. At a meeting with Parliamentarians, the Transport Minister informed of the efforts carried out by the government to improve public transportation. These include investment of more than US$2 billion, one quarter of which to buy 5,000 buses— mainly from China and Russia. Already some 360 new buses imported from China are in circulation, mostly in Havana. The government hopes to add soon another 1000 buses to service the rest of the island. Though Cuba has been importing buses, it still has a shortage. And if urban areas are underserved, many rural areas are barely served at all. Moreover, in the past, the rate of breakdown of imported buses has been very high, due in part to the poor conditions of roads, lack of training of drivers and mechanics, and lack of parts for repairs (many parts disappear from the repair shops and find their way into the black market). The result is a very high level rate of broken down and idle equipment. Allowing private individuals to get licenses to supplement public transportation and buying of new buses for the public transportation system will provide temporary relief, but the restrictions placed on the operations of the private taxis will severely limit their contribution and, unless the problems of maintenance and repairs of the buses are resolved soon, the relief will be short-lived. Cuba has bought new buses before but they have not lasted long. A vibrant private transportation system existed in Cuba before the revolution and one could develop again if the proper conditions for the operation of private enterprises existed again. Despite increasing its own oil production, Cuba relies heavily on Venezuela, whose socialist President Hugo Chávez sends Cuba nearly 100,000 barrels of oil a day. The Cuban government is conscious of the risks of depending heavily on one source for its energy imports needs. The experience with the Soviet Union has taught the Cuban government the implications of a sudden loss in supplies. Despite the subsidy implicit in the oil coming from Venezuela, the rise in international oil and oil product prices is having a negative impact on the Cuban economy. The 158,000 barrels of oil per day that were consumed in 2007 year cost US$8.7 million per day, and in 2008 they cost 32% more, or $11.6 million per day. Basic Industry Minister Yadira García has told lawmakers that crude oil production topped 2.1 million tons through June 2008, exceeding expectations by more than 6%. Combining oil and gas, Cuba currently has a production of about 4 million tons per annum, 47% of the needs of the country. Attempts have been made to find oil in offshore areas surrounding Cuba. The last major drilling effort for oil off Cuba’s coast took place in 2004, led by the Spanish-Argentine consortium Repsol YPF. It found oil, but not in commercially viable quantities. Inactivity in drilling since then suggests that Repsol YPF has not been eager to follow up with the required investment to extract oil from the areas. The Castro regime has been lauding offshore lease agreements with Norway’s StatoilHydro, India’s staterun Oil & Natural Gas Corporation, Malaysia’s Petronas, and Canada’s Sherritt International. Yet, there is no current drilling activity off Cuba’s coasts and Sherritt recently announced that it would limit its drilling to land sites. The Cuban government has repeatedly announced plans for new offshore drilling in the sea, but this has been postponed in 2006, 2007, and so far this year. The Cuban government has also sought other sources for oil imports, such as Angola, Azerbaijan, Equatorial Guinea, and Iran, but none of these sources is likely to provide the subsidies that Venezuela gives Cuba. And they could not replace the volume of supply from Venezuelan should Venezuelan oil supplies be cut. In the area of energy savings, the authorities claim that Cuba has made a significant reduction in energy consumption through its program to substitute light bulbs, refrigerators, and other electrical appliances with more energy-efficient units. But one hears complaints from the population about the high prices the government has charged for the new appliances and their poor quality and frequent breakdowns. Moreover, the new energy production program that relies on small electricity-generation plants (that operate using diesel fuel) is very expensive to run and cannot be used to replace the aging thermoelectric plants (which have been damaged by the use of Cuban oil with very high sulfur content). Domestic energy prices were sharply increased in late 2007. According to Granma, fraud related to the stealing of energy rose sharply in the first five months of 2008 compared with a like period last year. Most of this fraud was through the manipulation of electricity meters and the theft of electricity before it reached the meters. Cuba’s infrastructure is crumbling and the need for new investment is very large. Raúl Castro has stated that the government has plans to rebuild roads, pipelines, houses and railways. The proportion of gross capital formation in Cuba as a percentage of GDP dropped by more than half since 1989 and, according to Cuban economist Pérez Villanueva, it would have to return to about 25% of GDP to ensure a recuperation of economic activity and a sustainable rate of economic growth. In 2005 it was estimated at less than 10%. An integration agreement with oil-rich Venezuela, soft credits from China, and high nickel prices have brought about some growth in production and allowed for investment growth in some areas in the last few years, helping to reduce electricity blackouts, marginally improving public transportation, maintaining availability of some consumer goods and slowing down further deterioration in social services and housing. However, in view of the recent deterioration of the economic outlook for the world economy, the government has already announced a cut in public investment, reversing increases of recent years. The types of capital investments most needed in Cuba are the ones that in other developing countries are financed with long term credit at favorable terms made available by international financial institutions like that World Bank and the Inter-American Development Bank. These institutions also provide significant technical assistance to their member countries. Unfortunately, the Cuban government has chosen not to belong to these institutions. (It dropped its membership in the World Bank and the International Monetary Fund shortly after the revolutionary takeover of the government because it was not willing to adhere by the rules of behavior to which members must adhere.) Instead, the Cuban government relied, first on Soviet aid, and more recently on Venezuelan subsidies to try to make some of the needed investments. The Soviet Union proved to be an unreliable source, and only time will tell about Venezuela. Meanwhile Cuba has ended up with obsolete factories and run-down infrastructure. Cuba’s dual-currency system often forces citizens to buy necessities in a currency they are not allowed to earn. Strapped for dollars, Euros, and other currencies needed to buy imports, communist-run Cuba uses a multiple-currency system to conserve foreign reserves. It pays islanders in local pesos and offers some goods and services at peso outlets, often with hefty subsidies. But increasingly, it requires a dollar-like convertible currency unit, or CUC, at other shops and businesses, where prices are subject to little or no subsidies and some times incorporate substantial overpricing. Cubans pay 25 pesos for 1 CUC, a considerable sum when monthly salaries average around 400 Cuban pesos. Those who can best afford to buy consumer goods are those Cubans who earn a portion of their pay or have access to tips in CUC from tourism, participate in the thriving black market, or receive cash remittances from friends and family overseas. The dual currency system has increased the inequality in the population and is a source of great dissatisfaction. The system is further complicated by the prevalence of exchange and currency controls exercised by the Central Bank, which requires exporters to deposit all foreign exchange proceeds into a single account at the Bank and authorizes each individual withdrawal by importers, and the fact that the government applies different taxes and exchange rates whether the transactions are in U.S. dollars, Euros, or some other currencies, introducing more distortions into the economy. The government recognizes the four-year-old system hurts national self-esteem and widens social divides. Officials have vowed to end it once foreign reserves spike—a growing challenge as import prices soar and exports languish. The existence of multiple currencies results in numerous hidden subsidies and generate inefficiencies in the working of the market, as well as making it practically impossible for the authorities to gauge the significance of most economic indicators used to orient economic policy decisions. In order to promote efficiency in the economy and eliminate the hidden subsidies brought about by the multiple exchange system, the exchange rate should be unified and a single currency should be used for both domestic and international transactions. The currency in which the workers have to pay for the goods and services that they buy should be the same, with the same purchasing power, as the currency in which they are paid their salaries. Cuban government authorities have begun acknowledging that Cuba’s educational system, long touted as one of the accomplishments of Fidel Castro’s 1959 revolution, is suffering from inadequate training, lack of interest by teachers, and an “exodus” of professionals due to low pay. The quality of education has suffered in recent years because about one half of the teachers lack experience and sufficient training. The Cuban Education Ministry acknowledged a shortfall of 8,192 teachers in a report about the 2007–2008 school year. The report identifies lack of training of instructors as one of the main challenges in the sector. The government recently called for retired teachers to return to the classroom, recognizing the shortage of school instructors. Decree-Law No. 260 authorizes retired teachers and professors deemed to have the capacity to contribute their professionalism and experience, to receive, on a provisional and exceptional basis, the full salary of any teaching job they may fill, in addition to continuing to receive their pension. This decree was expedited because of the serious underlying situation while the overall new Social Security legislation is being considered. It should be noted that the current Social Security Act establishes that retirees can participate in paid work on the condition that the total of their new salary and their pension does not exceed the salary they received prior to receiving their pension and that they pay a new tax as a contribution to social security. Cuba had an extensive and vibrant private school system prior to the revolution that served to train excellent professionals and scholars in all kinds of fields. The revolutionary government nationalized the educational system in order to use it to indoctrinate the Cuban youth. Now, however, this youth is finding that the training received is lacking and that those that graduate from it are not offered jobs in which they can use the knowledge acquired, that the working conditions are unsatisfactory, and that the pay is too low for them to be able to make a living. Clearly, opportunities for gainful employment need to be created and the government is in no position to be able to do so. There is a need for private enterprise to develop to fill this gap. There should also be room for private education so as to provide the necessary labor market flexibility and to remove limitations on education arising from political considerations. While no information is available on the terms under which Cuba borrows in international markets, borrowing costs are likely to be high given the existing external debt arrears which have limited access to capital markets. The external debt burden appears to be high, particularly if measured by debt service payments as a percentage of exports of goods and services or as a percentage of government revenue. The analysis of Cuba’s external debt is hindered by lack of detailed official economic data. The Cuba Transition Project of the University of Miami reports a foreign debt of US$23.8 billion for the end-2007. There is also the debt of Cuba to the former Soviet Union that Russia inherited after the breakup of the Soviet Union in the amount of some 21.5 billion rubles. The issue here is: what is the exchange rate that should be used to convert the stock of this debt to U.S. dollars or any other convertible currency? This is an issue that Russia is likely to bring up in a future multilateral debt restructuring negotiations. Cuba defaulted on its external debt in the 1960s. It has failed to meet debt payments due to Argentina, Belgium, Canada, Chile, France, Japan, Mexico, Spain, South Africa and the United Kingdom, among others. The available information suggests that Cuba did not try to renegotiate its external debt for about 20 years. This was possible in part by Soviet economic aid. Since the early 1980s, Cuba has been renegotiating its outstanding debt with some of its creditors on a bilateral basis and generally honored the obligations acquired under that debt restructuring as well as the new debt obligations acquired from creditors after bilateral restructurings. To have a sustainable debt service situation Cuba needs to have debt relief. The efforts of the revolutionary government to negotiate debt restructuring agreements on a piecemeal basis does not address the problem in a comprehensive way and continues to limit the efficient participation of Cuba in international capital markets. The problems with external payments involve not only old past due obligations but also more recent ones. Canadian oil firm Pebercan, which produces oil in Cuba, said in late June that it had not received debt payments totaling US$37 million in April and May from stateowned Cupet due to “the difficult economic situation” connected to rising food and raw material costs. In addition several large international banks have suspended financial operations involving Cuba (two Swiss banks, UBS and Credit Suisse; three Canadian banks, Royal Bank of Canada, Bank of Nova Scotia, and Toronto Dominion Bank; and two British banks, ING and British Barclays). More recently, the Japanese credit insurance agency suspended all future insurance of credits given by Japanese firms to Cuba, effectively closing Japan as a source of new financing to Cuba. Vice President Carlos Lage announced in June 2008 that “some of the main investment projects have been reduced and further reductions will be necessary,” providing no further details. At the same time, international market prices for the most important commodity export, nickel, have fallen from the highs of a few years ago, sugar production has failed to recuperate, and room occupancy from tourist arrivals has declined. Oil import costs also have risen significantly even though Cuba receives soft Venezuelan financing for about 40% of its needs. Cuba is feeling a financial pinch in spite of heavy support from Venezuela, China, Brazil, and Iran. Credits and foreign investment in the past have helped cover sizeable trade deficits, but these credits eventually have to be repaid. The likelihood of Cuba having access large amounts of foreign credits necessary to realize the needed capital investments seem bleak. A significant effort by the Cuban government is needed to renegotiate the existing foreign debt. Cuba could benefit significantly in this regard if it could rejoin the International Financial Institutions, like the World Bank, the International Monetary Fund, and the Inter-American Development Bank, as well as qualify for membership in the Cotonou Agreement. To tackle many of the challenges described above, Cuba needs a very fundamental structural change from an economy dominated by an inefficient central bureaucracy to a decentralized decision making system where private individual should be allowed to engage freely in economic activities and investments. Fifty years of inefficiencies have shown that the government cannot—and should not—try to control everything, and that a private market economy would be able to resolve much better many of the outstanding economic problems. The lack of mobility in the labor force (both in terms of regional mobility and inter-sectoral mobility) is one of the strongest brakes to increased production and productivity. It is notable that the same individuals that have no motivation to work while they live in Cuba become highly productive and successful in their activities when they cross over to Miami and are able to operate in a free market economy. Even a small liberalization of the agricultural markets brought about an almost immediate positive response in production. A lot more could be achieved, not only in agriculture but in other sectors as well, from a liberalization of the markets, including by allowing widespread development of self-employment activities (actividades por cuenta propia) and the establishment of private microenterprises. Credit facilities could be set up in the form of small loans to small businesses as in done in many countries encourage the development of small enterprises. Finally, for the economic system to work efficiently there is need for a legal framework that is fair and is consistently applied, not used as a tool for political motivation, and is well know and respected by the population. The development of what has come to be known as “double morality” in Cuba is the product of the lack of a transparent and fair legal system, one in which individuals feel that the law is there to protect them from arbitrary decisions by those who govern and one that the population would be willing to abide by it. Until such a system is instituted, Cuba will continue to be dominated by the double morality. As discussed in this paper, the Cuban economy faces numerous and substantial challenges, which cannot be addressed unless there is systemic change in the island. To date, there is no evidence that Raúl Castro’s administration will promote the needed systemic reform although he has taken discrete reform measures (see Appendix). It should be noted, however, that Raúl Castro has hinted recently that further reform will be stalled by rising global food and oil prices. He has moved to dampen rising expectations, warning that global economic problems may slow increases in worker pay, one of the key economic reforms he has proposed since taking office, and announced instead the need to increase age retirement limits and asked workers for further sacrifices. Again the Cuban government is using external developments as an excuse to cover for its lack of competence in carrying out needed reforms. The Cuban government has already announced as “inevitable” that there will be adjustments to the economy that will probably result in increases in prices, especially of energy, food, and personal hygiene products, in a country where the later are already quite high in relation to salaries. Food products that are sold in foreign exchange in government stores had experienced increases of up to 18% last May. Among the products whose prices went up are: cooking oil, soap, milk, pastas, and cheese. There are strong rumors that there will be a sharp increase in the prices of gasoline and diesel. Despite the rise of international prices of oil and oil products, domestic gasoline and food prices have remained relatively unchanged in Cuba this year due to state price controls, forcing the government to spend more on subsidies. A liter of high premium gasoline currently costs 0.95 CUC (about US$1.15). Electrical blackouts that used to plague the country have become rarer and shorter over the past year, and brand-new Chinesemade buses can be seen in the streets. Contrary to expectations, Raúl Castro failed to announce more changes to the communist system during a major address on July 26, 2008. Some Cubans hoped he would use the speech to ease restrictions on international travel or announce other incremental reforms, but none came. Some Cubans say their hopes for change under the new government are fading. Many commented: “there are a lot of people on the street who talk about change, but we haven’t had even one economic or political reform that counts.” Instead, Raúl Castro warned of more economic austerity and used the 48–minute speech to command Communist Party leaders to put Cuba’s house in order and fulfill promises they have made to the Cuban people. Mr. Castro has been a sharp critic of unnecessary red tape and sloppy management, and he has warned that ministers and officials responsible for the project would be held accountable for any delays. ”If they don’t meet the targets we’ll send them to you and you can do with them what you think fit,” said Mr. Castro. 1. This essay was written before the recent hurricanes that hit Cuba in late September-October 2008. The problems identified here become even more pressing in the aftermath of the hurricanes and the destruction they caused. 2. 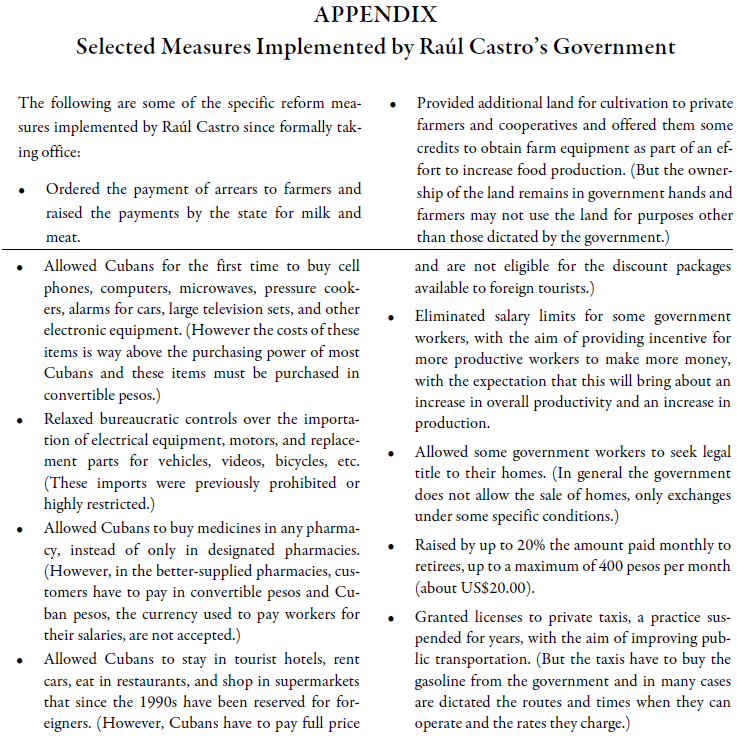 Selected reform measures taken by Raúl Castro’s government are given in an Appendix. 3. To this number we would have to add an estimated half a million houses affected by hurricanes Ike and Gustav, of which about 100,000 were totally destroyed.